Mo offroading. New to this Cherokee forum. Welcome. Specs on your rig? Pictures perhaps? It would be a 93 xj. Upgraded 8.25 to the 29 spline welded. Spartan locker in the d30, upgraded axel shafts there as well. Np231. I have owned it for a year and 5 months now. Just been around our offroad park here in Joplin Mo. The Jeep in your Avatar I assume? Also 4 1/2 lift with 34x10.50 super swamper ltbs. I've been to smorr loved it there. But here around February 17th or so I'm headed down to hot springs with a buddy of mine. Heard that's a pretty sweet park down there. Yes that is mine. When I first got it. Mo Offroading! New to forum! I have had my XJ 4 months. 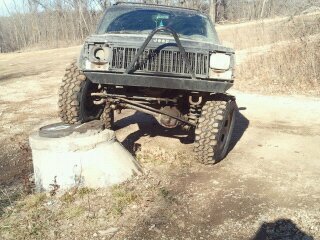 I have been wheelin at J&D Offroad park in Joplin about every weekend! got a few events coming up. i just posted new spring event in the midwest section. it'll be in jackson MO and its for a good cause!!!!! this fall were getting a bunch of people together for a weekend at flat nasty. we will be camping during both of these events so bring some stuff with ya. i'll be cooking for us for one evening on the spring trip and a couple on the fall trip. hope to meet you guys there!!! I will check the dates and see if I can get away for the weekend! How many you have signed up for Nasty Flats? [QUOTE="bdub80"]I will check the dates and see if I can get away for the weekend! How many you have signed up for Flat Nasty? we got about 7 i think at the moment. but we moved it to the fall. How good of a park is flat nasty?